There are several models of gold finish on the wood finishing. Now we want to discuss about a gold finish with antique impression. It is the gold color which impress the old and dirty looked. The antique looked is made by the glaze application and some physical distress and some sand trough to the gold layer. Principally the antique finishing for the gold is created as a antique solid color. The gold color can be considered as a solid color or paint color finish. The antiquing can be done with the sand trough to the gold color and followed by the glaze application. Physical distress done in order to enliven the impression of the antique. Beat and hit the surface by chain, rock and file little bit to make some damage on the wood surface. Sand the wood surface to smooth the distress marks. The red is the most widely used as the base color under the gold finish. Traditionally the red color will strength the gold color on it. In the antique gold finishing the red color will come trough when it is highlighted. The red color will produce a nice combination with the gold color above. A red color base coat is applied by spray evenly allover the surface. Let it dray and do sanding on the red base coat layer. Then repeat the application of the base coat until we got an even red color and with even surface. Usually we need to apply 2 or 3 layers of base coat to obtain a smooth and even red color. Application of sealer is used to coat and protect the base coat and produces a smoother surface before the application of gold leaf. Sealer is applied by wet spray coat. Wait it to dry and do scuff sanding to prepare a smooth surface for the gold leaf application. In this finish we use a gold paint for the gold color. 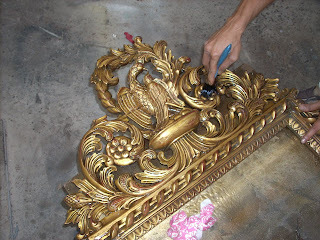 Gold paint is applied by spray evenly to the entire surface. Wait the gold paint to dry. And then do highlight by do sanding on the gold paint layer. Sand trough is sanding the gold layer to open the gold color in some parts. The rubbed gold paint layer will display the red base color. 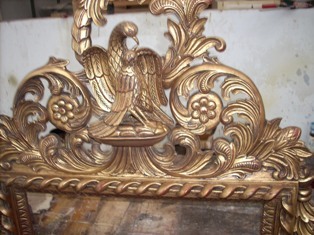 The combination of gold and gold colors will produce gold finishing with life and interesting antique looked. Do the sanding on the surface of gold carefully. Use sandpaper with # 360 ​​or # 280 grade. Rub to the outer edges parts of the gold paint. Do the rub trough naturally as much as possible to make an impression of paint wearing since of age and usage. The finishing appearance is largely determined by the rub trough in this step. 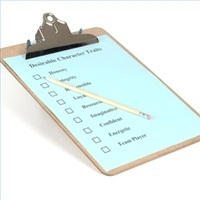 Check the antique resulted, make sure it seem as we want before we continue with the next process. 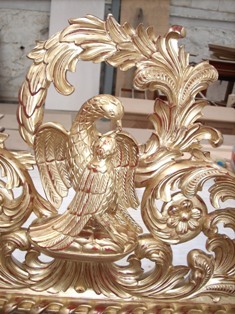 The sealer coat is required to give protection to the gold color. Layer a coat of sealer by spray wet evenly. Wait it to dry, then we can continue to the glaze application. We do not need to do sanding on this step. The glaze is used to generate more antique impression in the finishing. In this finishing we use a black-gray powder glaze to mimic the dust looked. Glaze is brushed evenly to fill inside the crevices in the carving. Wait for the powder glaze to dry then highlight by using steel wool. Wipe and remove the glaze on the outside part and leave the glaze inside of the carving. We want to make a old looked dusty gold finish. The sealer application is needed to protect the finishing looked. Apply a layer of sealer by spray evenly to the entire surface. Wait the sealer coat to dry, then scuff sanding the sealer to prepare a smooth surface before the top coat application. Top coat as a final layer which provide a protection to the finish and form gloss. In this antique finish model we can use a low or medium gloss top coat. Apply the top coat by spray evenly to the surface overall. Wait the top coat to dry and the finishing process is completed.